Distributor: Currently licensed by GKids. Also Recommended: Kiki's Delivery Service, Panda Kopanda, Aria. The Kusakabe family are moving into a countryside house, partially so they can be in a more accessible distance to the hospital where the mother of the girls have been spending her time recovering. While playing around the house, the two daughters eventually gets caught up with the spirit life of the countryside, which includes the Totoro; a race of beings that supposedly live underneath the gigantic tree nearby. 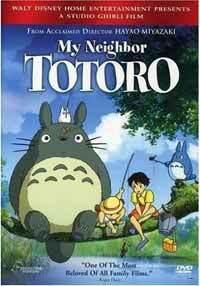 My Neighbor Totoro is my very own gateway to the wonderful works of Studio Ghibli, and also my favorite movie from that studio. Ever since I had it recorded from a Swedish TV channel, complete with a well-made dub, I've been loving this movie and its childish wimsy and atmospheric (and mostly realistic) portrayal of countryside scenery. While the movie is technically about the whole family, it's mostly about Satsuki and Mei; the two daughters of the household. When we first see them, they're sitting in the back of an open cargo truck, right underneath a load of tied-together furniture in a scene that's bound to put "more responsible" parents into cardiac arrest. The truck arrives at their new home, and the girls jump out, giddy at the prospect of scouting out their new home. Like most female Ghibli characters; Satsuki is young, but responsible and helpful. She's also a bundle of limitless energy, and her life is, for the most part, lived at full speed. (Which is all the more amazing, given the rather sedate and slice-of-life-ish pace of the movie itself.) She quickly connects with the local boy, Kanta, as does he with her; awkward and seemingly hostile at first, but generally supportive whenever the need arises. Her little sister Mei is all fun and games. She's the first to meet Totoro while she spends her preschool childhood roaming around in the garden outside her new home. Like most children her age (I'm guessing somewhere around five years), she completely loses sight of her surroundings once she finds something of interest. And one of those points are definitely the Totoro, the spirits of the forests that come in all sizes; from the barely-bigger-than-rabbits to the one that are bigger than the pandabears they kind of resemble. Well, at least insofar as Totoro being slightly reminiscent of the panda papa in Panda Kopanda. They, like most other spirits, have a tendency to appear when there's no adults around, or at the very least, the adults doesn't seem to notice them, even if they fully believe in them, like Nanny does. Much as I like the earlier scenes in the movie, the appearances of the Totoro -- particularly the biggest one -- still ranks as the most memorable ones of all. Especially the one with the bus stop, which is my favorite scene of all, mostly due to the complete bizarreness of it all. Tim called it a slow movie, and I guess I could see why people would think that. It doesn't really lecture anyone about anything, nor does it have any specific story to tell outside of the initial setup of which the movie is centered around. Maybe more than anything, this movie depends on you being somewhat familiar with some of the elements and situations it provides, like the way strong winds rattles windows in old houses, or how rushing into deep foliage can make you completely lose your sense of direction, or even the difference in how people act towards each other in the countryside compared to in cities. It's basically based more on random feelings rather than any kind of message, but that said, I think there are still some things you could gain out of this, even if you're not familiar with it in any way. Of course, I was already well past 20 years old the first time I watched this movie, which has made me honestly curious what I would have thought about it when I was a child. Maybe that's exactly what this movie is about. Recommended Audience: Little kids might find Totoro to be a bit frightening, but only at first. There's a family bath scene that's not even really worth mentioning. Everybody can see this one, no problem. A G-rated anime, woohoo!